Below you will find a complete list of the farmers markets operating within Collin County. We will list markets that have recently closed, because we understand that some of our viewers may be looking for that market. If you are aware of a new farmers market or we've missed one, please let us know. For a day-by-day listing of farmers markets, please visit our Calendar of Events. These farmers markets may operate on a seasonal basis or there may be limited markets in the winter months (November-March). Sadly, this market and farm shop have permanently closed. Open the second and fourth Sundays of every month. Guest speakers, kid's craft corner, lunch, live music, fun for everyone! The historic Onion Shed hosts their version of "Trade Day" with all types of shopping featuring produce, crafts, food, jewelry, antiques, and more. Held on the first Saturday of each month! Local growers offer produce and you'll also find baked breads, meat from local ranchers, honey, arts and crafts, and various other products. Live music. Open Saturdays April thru October. The McKinney Farmers Market at Chestnut Square is held every Saturday, April 6 - Nov 23 and bi-weekly during the winter season, Jan-March. 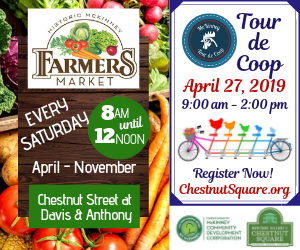 Offering a variety of locally grown produce, meat, flowers and dairy products as well as artisanal specialties such as baked goods, salsas, wine, jellies, preserves and canned goods, honey, sweets as well as homemade soaps, candles, flowers and other art/craft items. This market has been cancelled. Friends and neighbors come together at the market to shop produce, baked goods, and other items. Sundays will include live entertainment. 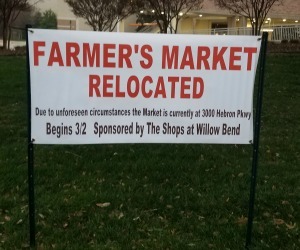 The Hebron/Carrollton Farmers & Artisan Market (formerly The Shops at Willow Bend Farmers/Artisan Market) opens Saturday, March 2nd. Conveniently located approximately one mile West of the Dallas N. Tollway where Park Blvd. becomes Hebron Parkway. 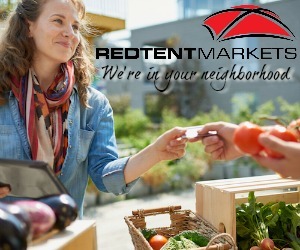 For directions click on the address below or call Red Tent Markets at 972-965-1144. Locally Grown Fresh Produce, Handmade Artisan Goods and Crafts, Ready-Eat Take-Out, Homemade Baked Goods, Pickles. Jams & Jellies and other delights are featured each Saturday from 9 am to 2 pm. Admission is free! Plenty of parking and fun for the whole family!! Brought to you by Red Tent Markets L.L.C.